CF-XJM at Prestwick - EGPK, Scotland. CF-XJM at Shannon - EINN, Ireland. CF-XJM on the grass with colleagues. • 5329 Royal Norwegian Air Force. Initially coded O-AE. Delivered by ship in a crate . Formally handed over on 02-Mar-1954 it arrived at Oslo Harbour on 08-Apr-1954 and transported to Kjeller AFB where it was assembled. Note: Withdrawn from service at Vaernes Air Base 11-Jan-1968 and passed to Halle & Peterson, DHC agents in Norway for disposal. • CF-XJM Thomas Lamb Airways Ltd., The Pas, MB. Regd Apr 1968. 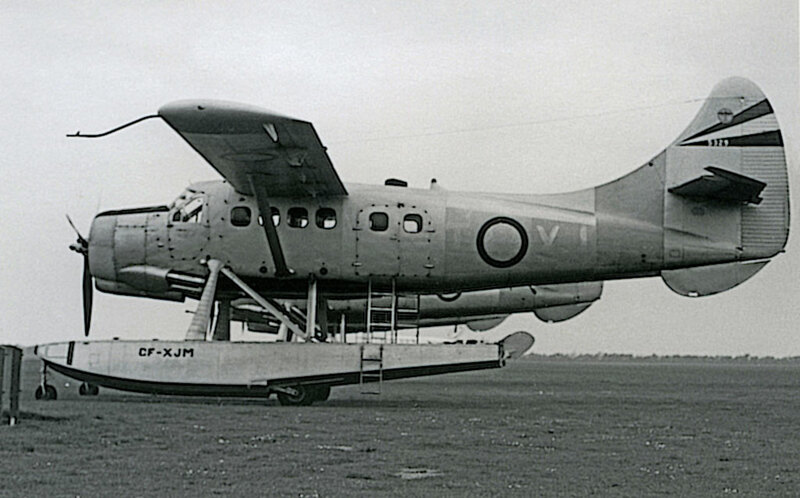 Note: Flew from Norway to The Pas on amphibious floats with two other Otters, purchased by Thomas Lamb from the same source, routing Vaernes, Rotterdam, Manchester and to Shannon where long range tanks were fitted. Then via Prestwick, Stornaway and Iceland and Greenland to Goose Bay. An “uneventful” trip until 125 miles from The Pas and the aircraft lost a cylinder and the pilot elected to land on a lake near Norway House, MB where an engine change was carried out. A few hours earlier and a different outcome could have lost the aircraft. However life was eventful afterwards. Total Time: Apr-1968 5,554 hrs. Incident: Trout Lake, Severn, Ontario, 03-Jun-1968. En route to Pickle Lake the pilot tried to lift th main gear on the amphibious floats. There was no indication of wheel up or down and after trying to put them down, which gave no results, he tried the selector in both up and down position but no indication of gear up was shown. A helicopter that was travelling with the aircraft was asked to come and fly around the aircraft to check the landing gear situation.. A standard approach was initiated, with the float heels put down first. The aircraft touched down, then the nose dug in. The pilot opened the throttle and tried to pull it back out. The aircraft nosed down into the lake. The three passengers went out the aft door, and the two crew out the cockpit doors. The Otter came to rest on its nose. The passengers and crew escaped and were able to stand on the wing. A boat from Ontario Lands & Forests came and took them ashore. An attempt was made to try and upright the aircraft, but by that time the wind had turned the aircraft and it was lying on its back, fifty yards from the shore and a half mile from the seaplane base. It was recovered and repaired. Incident: The Pas, MB. 09 Dec-1968. The Otter took off from the gravel runway at The Pas, with the pilot and three passengers on board. After departure, an uncontrollable fire developed in the engine compartment. The pilot landed the aircraft back at The Pas and although the occupants safely exited the aircraft, the Otter was destroyed by fire. Subsequent investigation revealed that a drain plug was missing from the carburettor float chamber, allowing fuel to escape into the engine. The fire occurred five flight hours after the installation of an overhauled engine. On overhaul, this drain plug is normally installed finger-tight only, requiring the engineer to tighten and lock-wire the plug during the engine installation, a procedure overlooked in this case, with tragic consequences. The cause of the crash was given as “incomplete inspection after engine installation”. The scrap was bought by Superior Airways of Fort William, Ontario. 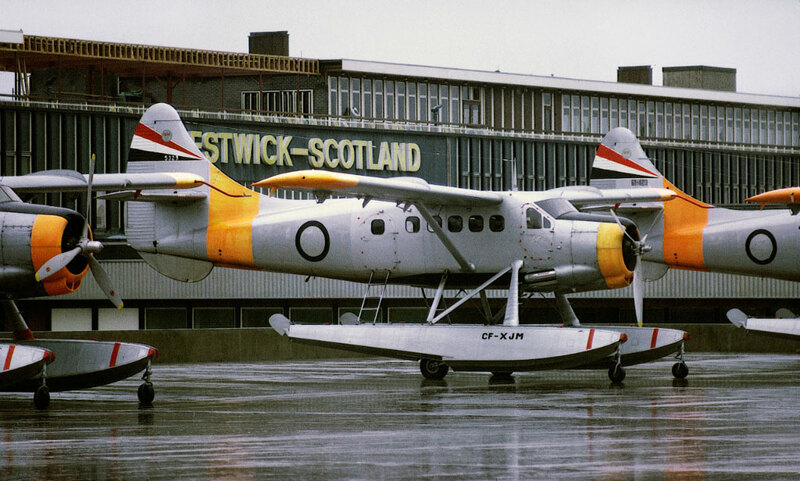 Otter number 29 was one of the first six of ten DHC-3 delivered to the Royal Norwegian Air Force, as explained in relation to Otter number 18. The batch of six were delivered in crates by ship and formally handed over on 2nd March 1954. They arrived in Oslo Harbour on 8th April '54, being assembled at Kjeller Air Base, Oslo. The Otter took serial 5329 and code 0-AE. The Otter was originally assigned on 28th May '54 to the Air Force Flying School at Vaernes Air Base, for the training of pilots and mechanics. On 30th July '54 it was assigned to the Communications Flight at Bodo Air Base in northern Norway and was re-assigned in January '55 to the Communications Flight at Orland Air Base. In September '57 it went to the Horten Marine Base for installation of straight floats and left there on 14th September on ferry to its new base at Skattora Seaplane Base, Tromso where it joined the 'Norseman Flight'. It remained with the Flight until January 1959 when it went back to the Horten Marine Base for the installation of amphibious floats and the following month it joined 7193 Stotteving (Support Flight) at Bodø Air Base. On 7th April 1959 the Otter made a wheels-up landing at Andoya Air Base, suffering minor damage which was repaired. It continued to serve at Bodø for the remainder of its Air Force career, making periodic trips south to Wideroes at Fornebu Airport, Oslo for depot maintenance. In January 1966 the 7193 Support Flight was re-designated 719 Squadron and in January 1967 the Otter received a new code of XJ-T. It continued to fly with 719 Squadron until it arrived at Vaernes Air Base on 11th January 1968, in company with Otter 423, on withdrawal from Air Force service. It had flown 5,483 hours. 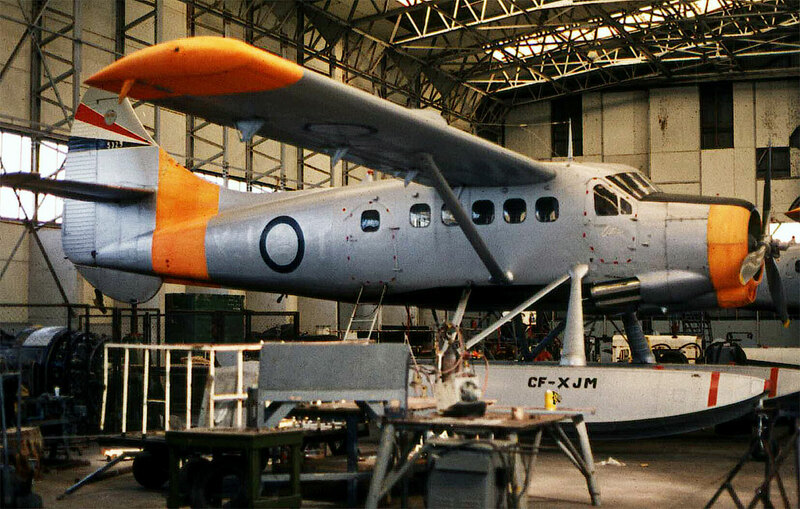 It had been replaced in service with 719 Squadron by the Twin Otter. As with the other former Royal Norwegian Air Force Otters, it was handed over to Halle & Peterson, Oslo who were the DHC agents in Norway for disposal. Three of the former Norwegian Air Force Otters were sold to Thomas Lamb Airways Ltd of The Pas, Manitoba, number 29 which was allocated Canadian registration CF-XJM, number 423 which became CF-XIL and number 441 which became CF-CDL. The purchase price was $30,000 a piece, and at the time of sale all three Otters were located at Vaernes Air Base, Trondheim, Norway on amphibious floats. Thomas Lamb Airways (later called Lambair) were responsible for returning many Otters back to Canada from foreign parts, and arranged for ferry pilots to fly the three Otters back toCanada. A ferry permit was issued for the delivery flight from Vaernes Air Base to The Pas. The three Otters set off in formation, flying first to Rotterdam in Holland (also noted at Soesterberg Air Base nearby on 22nd April '68), then to Manchester, England and on to Shannon in Ireland where they arrived on 25th April '68. At Shannon, ferry tanks were installed in the Shannon Repair Services hangar, for the ocean crossing. The three-Otter formation departed Shannon on 4th May for Prestwick, Scotland. All three arrived at Prestwick in formation, quite a sight according to local aviation enthusiasts as they peeled off for landing. Then it was on to Stornoway before setting off across the Atlantic via Iceland and Greenland to Goose Bay. The flight was reported as uneventful (if crossing 2,500 miles of North Atlantic at 100 mph in an ageing, single-engined aircraft can be considered uneventful) until the formation got within 125 miles of The Pas, when XJM “blew a pot” (cylinder) and had to land on the nearest lake, south-east of Norway House, Manitoba. A few hours earlier and it would almost certainly have been lost in the ocean. It required an engine change before being able to complete its flight to The Pas. The Otter was overhauled at the Thomas Lamb Airways base at Grace Lake, The Pas and inspected on 16th May 1968 for the purpose of its Canadian registration. It then had 5,554 hours on the airframe, an increase of 71 hours since retired from Norwegian Air Force service, most of which comprised the lengthy ferry flight. It then entered service with Thomas Lamb Airways, but only three weeks later was already in trouble. On 3rd June '68 the Otter departed from Trout Lake, Severn, Ontario en route to Pickle Lake. The following is the pilot's report of the incident: “After flying over the settlement at Pickle Lake, I tried to lift my main gear on the amphibious floats. There was no indication of wheel up or down and after trying to put them down, which gave no results, I tried my selector in both up and down position but no indication of gear up was shown.” “I checked that all seat belts were done up and advised the passengers what they may expect. I called CF-MWF, a helicopter that was travelling with me and asked him to come and fly around us. I made a standard approach, trying to put my heels down first. I felt it touch and then the nose dug in. I opened the throttle and tried to pull it back out. We nosed down. I cut the throttle and hollered to get out. The three passengers went out the aft door, the two crew out the cockpit doors. The Otter came to rest on its nose. We all got out and were able to stand on the wing. A boat from Ontario Lands & Forests came and took us ashore. I called base and then returned to try and upright the aircraft. By that time the wind had turned the aircraft and it was lying on its back, fifty yards from the shore and a half mile from the seaplane base”. installation, a procedure overlooked in this case, with tragic consequences for CF-XJM. The cause of the crash was given as “incomplete inspection after engine installation”. The scrap was bought by Superior Airways of Fort William, Ontario.